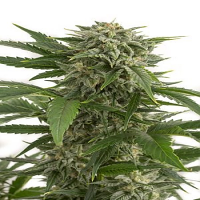 Tangerine G13 can also perform well when grown outdoors although the slightly longer flowering time means that regions that avoid early autumn rains will be a better bet for a fully successful harvest. 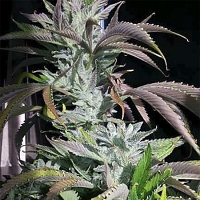 Tangerine G13 Feminized Marijuana Seeds by Amsterdam Genetics Seeds: Tangerine G13 is a potent new cannabis strain that is slightly more indica than sativa. Its sweet, fruity flavour precedes an uplifting high which becomes more physically relaxing in higher amounts. Tangerine G13 was bred from the sativa-dominant Tangerine, a very fruity strain, with the US legend that is the G13, said to have been smuggled out of an American government cannabis research faciltiy many years ago. 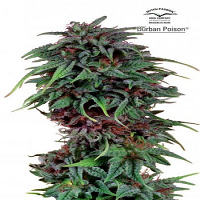 It has an extrememly vigorous vegetative growth phase, due to its sativa heritage, which makes it a very suitable plant to cultivate in a SCRoG set-up. 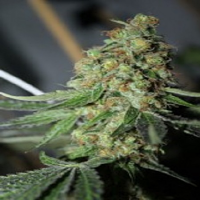 With a short period of growth it can also respond very well when grown in a SoG which will keep the plant's size more manageable allowing many plants to be grown closely together under one light. In most situations these plants will reach a height of between 120 - 150 cm. indoors with bud production up to 500 gr/m2 under a 600 watt grow light with 10 weeks of flowering. 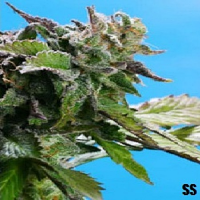 Tangerine G13 can also perform well when grown outdoors although the slightly longer flowering time means that regions that avoid early autumn rains will be a better bet for a fully successful harvest. In this environment plants can reach up to 250 cm. tall although the best conditions and care will probably be necessary in order to achieve such a result. Yield per plant is likely to be in the region of 400 - 600 gr. The dried buds have an attractive light green colour and a sweet, fruity flavour with citrus notes. THC production is very good at 20% along with 0.1% CBD, 0.08% CBN, 0.07% THCV and 1.8% CBG. The effect as has been alluded to above is initially very uplifting, inducing happy, euphoric feelings that may provide something of a boost to your creative moments. With increased consumption, however, the effect will morph into a much more physical stone with an extremely relaxed sensation. 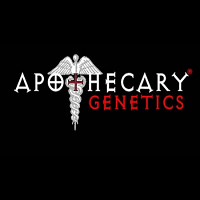 Its uplifting quality makes it a good therapeutic selection for those suffering with issues around stress and even depression, with others finding relief from pain and also insomnia.